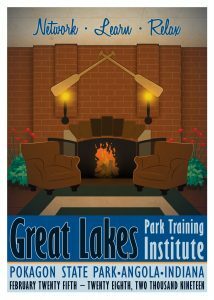 Pokagon State Park in Angola, Indiana hosts the annual Great Lakes Park Training Institute each February. Angola is located in Steuben County in the northeast corner of the state just one hour north of Fort Wayne, Indiana. The beautiful Potawatomi Resort and Conference Center located on the parks grounds is the official conference and hotel site. 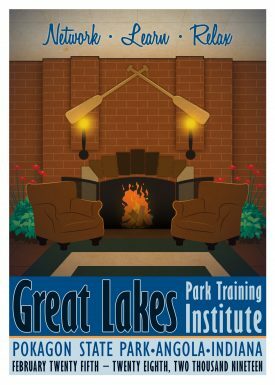 On the shores of Lake James and Snow Lake, amid the rolling hills of Indiana’s lake country, Pokagon State Park offers unexcelled opportunities for outdoor recreation at all seasons of the year. In a region where the Potawatomi Indiana people ruled for many years, the park takes its name “Pokagon” from their last two, most notable leaders, Leopold and Simon Pokagon (father and son). By treaty, Potawatomi transferred to the federal government approximately one million acres of land, including the present site of Chicago, at the price of three cents an acre. The lakes form an attractive background for Pokagon, offering excellent fishing, boating and swimming throughout the summer, and a perfect setting for many winter sports when the snow flies. There are two beaches, twelve miles of trails, and ample opportunities to enjoy lake shores, wooded hills, wetlands and open meadows. Nature Center – Exhibits on park’s natural and cultural history. Staffed by an interpretive naturalist to help with your discovery of nature at its best. Stables offering guided horseback riding. Hayrides also available upon request. Indiana’s only refrigerated Toboggan run, 1,780 feet of two refrigerated tracks; you never need snow to enjoy this wonder, it is even equipped with a speedometer! Ice Skating, Ice Fishing available on Lake James weather permitting (at your own risk). Spacious Sundeck connected to the Inn a great place to sit and relax, beautiful enough for an outdoor wedding ceremony with Lake James as a backdrop!For More information on Pokagon State Parks and the Potawatomi Inn please visit the below websites. Air transportation is available through the Fort Wayne International Airport, which is serviced by several major carriers. Transportation from the Fort Wayne airport to Pokagon State Park can be arranged through several rental car companies located at the airport. When driving Pokagon State Park is easily accessed from Exit 144 on the Indiana Toll Road or Exit 354 on I-69. For further directions, please click here.